Text adventures? Why not? It's been a lazy week so far - two today to stave off the August blues. Welcome to Dream Valley is currently abandoned, but like its sibling features a full combat system and is significantly more complicated than your run-of-the-mill text adventure. Playing as a Unicorn, Pegasus, Earth Pony, or Unicorn, hone your skills while exploring Dream Valley! 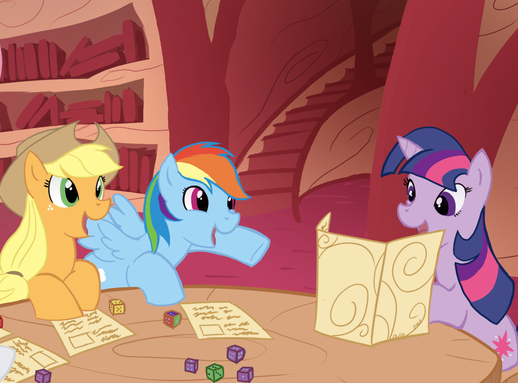 The dedicated team behind MLP: Roleplaying is Magic is gearing up for the Season 4 edition of their popular tabletop system! Seems like just the other day they were releasing Season 3. Right now, the team's seeking applications for groups of play-testers interested in playing the game as it develops and skyping in some feedback. If that sounds like you, hit them up with an application! Anyhow, I'll stop rambling about unrelated things and let you check out the demo while I wait around for Taylor. Enjoy! I could marvel at the ever-expanding list of ponified games, but to be honest, I'm not even surprised any more. Minesweeper. Ponies. Ponified Minesweeper. What took you guys so long? Ponysweeper is exactly what it says on the tin. Playing as Twilight, excavate a garden full of handily numbered cabbages/eggs/watermelons while avoiding the buried changelings. Board size and number of changelings can be modified in settings, and I can't complain about the execution. Have at it! There are times when Church Crusade of Darkera Studios is unable to do much more work on Rise of the Clockwork Stallions (such as when they are designing levels), so in his spare time he's been working on a remake of Magic Shards to keep him sharp. At first I wasn't so sure that this was a good idea, but now that I've actually had a chance to see it I'm rather impressed. Aside from several bugs, which are to be expected from a pre-release demo, the project is superior to the original in nearly every way. The creator really has improved a lot over the course of the past year; I'm quite interested in getting the chance to review this updated version in the future. And yes, the demo doesn't have that Canterlot -3 bug that prevented Windows 8 users from proceeding any further in the original. Much rejoicing will be had amongst the few that use it. As a promotion for ongoing BUCK convention, Darkera Studios has decided to release a special demo for Rise of the Clockwork Stallions, along with a trailer featuring art from the talented DragonGirl983. Thing is, given that this is a special demo you only have until Tuesday, August 27th to download it before the link is taken down, so you should probably pick it up as soon as possible. There's also a fancy wallpaper for those of us whose desktops lack six-eyed robots, which can be found here. There's also a trailer for their Magic Shards remake, but it deserves its own dedicated post so I'll put it up later. Conveniently, a video of Filly Gamez's BronyCon panel was just released on Youtube, in which they finally admit the truth about their shutting down (which had to do with that unofficial Flash port we posted a while back) and showcase some footage from their new game, A Foal's Errand. Unlike their previous effort it actually appears to be pretty good, although unfortunately there's no indication as to when it will be released online. There used to be some other stuff in this post, but I removed it for being flamewar bait. 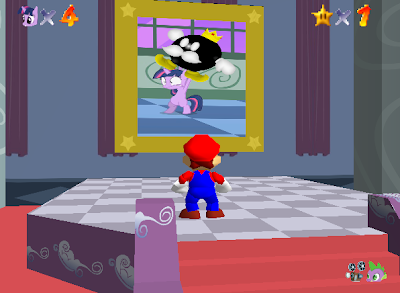 Silly Mare Games, SylrePony and others have joined forces, attempting to synthesize the best elements from several of their previous games. Drifter's a spiritual successor to Stroll and Derpy Buddy, among others, and comes from some of the same folks currently working on the Nightfall project. 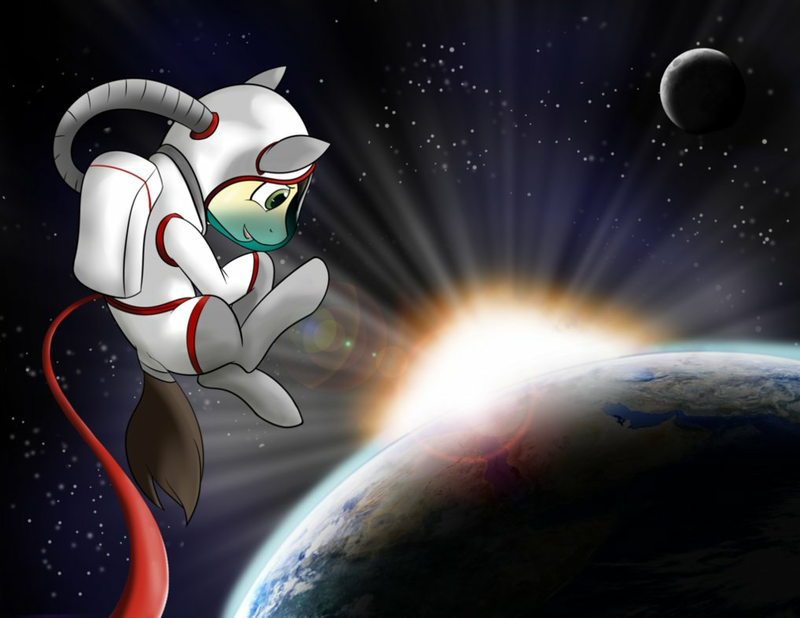 Derpy Hooves must travel to the ends of the earth, and if you want to find out why, you'll have to lead her there. Find the review after the break! Scootaloo's bringing the news! That, or I needed an excuse to use this vector. Important updates from the Ponyplace and Nightfall projects after the break! The card games are multiplying! Just a few weeks ago, they were practically off my radar. As I Recall: Friendship is Magic is set in a universe where Equestria has been blasted out of existence. As a human, you must use your memories of characters and events within the show (represented by cards) to restore Equestria to the way it used to be. To play, each player must first build a deck (ideally, one affiliated with a certain Element of Harmony) from the 360+ cards provided. 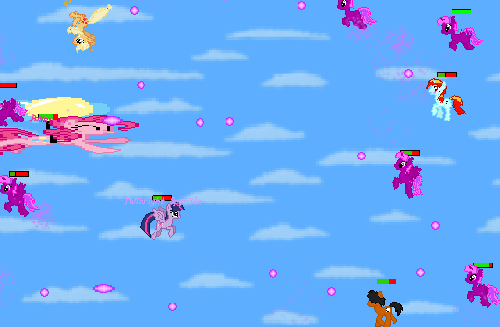 At the beginning of the game, players must build up their supplies of the Elements, which act as mana pools and enable them to play ponies and items. While hindering your opponents is a valid strategy, the game revolves around reaching the 30 harmony points needed for victory. Enjoy! A few days back, we received this little trailer for Rise of the Ponies, a sandbox RPG set in a side-scrolling Equestrian landscape. The trailer features a brown, sword-wielding earth pony exploring the landscape and hacking up a few baddies - and little else, as the game is still in pre-alpha. Still, the spriting and gameplay look promising. Give it a watch! Oh, and the team's seeking help - so if you're an interested musician, sound artist, or writer, contact mirtorande (at) gmail.com. Play Super Mario 64 on an emulator? Never fear, we've got ponies for that. The Super Mario 64 Texture Pack is at it's best inside Peach's castle. The walls are painted with a bright Equestrian landscape, the floor bears Celestia's seal, and stained glass Nightmare Moon and Celestia replace the original circular window. In-level, apple trees are visible and the ground textures have changed somewhat, but the feel of the game has changed little. Still, it's entirely worth a try! Trailer and installation instructions after the break! 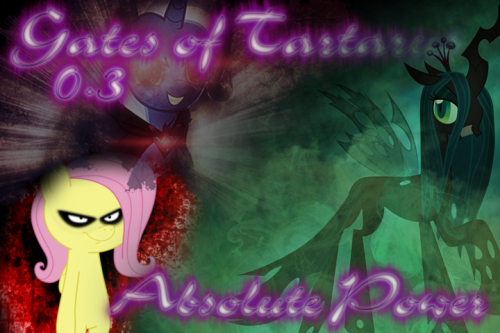 If you've never ventured farther into the gaming fandom than ponified video games, what better time than today to check out the tabletop side of things? While Roleplaying is Magic still takes the cake for length and comprehensiveness, we've got two other pen and paper RPG adaptations today. Find them below the break! Reminder: The Ponies for Pathfinder Kickstarter ends Saturday 8/24 at 9:24 PM UTC! Sometimes I question the wisdom of those who choose to develop 3D games in Game Maker, as there are many far better engines suited to the job. Still, that doesn't mean that one can't create a decent 3D fangame in there, as Never Heard From Ever Again hopes to be. I'm not sure if it will achieve that goal as of yet, given that the current version is a short little demo using a placeholder model for the main antagonist, but from what I've seen it isn't all that bad. It does rely a little too much on jumpscares, however, and it seems to have some problems running in Windows 8. 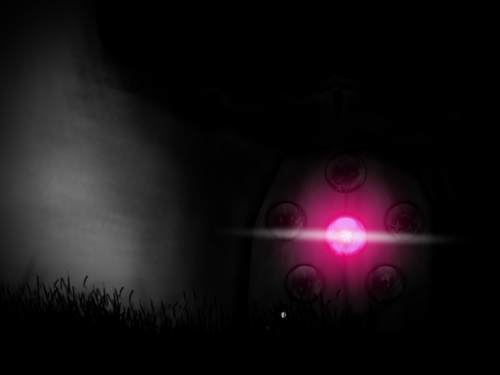 Hopefully we'll get more progress updates in the near future, but in the meanwhile you can download the game in order to get your daily dose of jumpscares. You might also want to check out the README file, as it explains the backstory and whatnot. For those of us who either went to BronyCon or were following @NebularFusion on Twitter this is already old news, but the nature of Starlight Studios' Project Cygnus was revealed via playable demo at the convention to be a sidescrolling action game named Megamare X (cashing in on the name that MegaPony should have taken long ago). I haven't come across any clear pictures of the gameplay itself, but the overall reaction from those that have played the demo seems to be positive. And don't worry; according to the official post on the subject the game will available for download on their website, and will have builds for Mac OS X and Linux thanks to it using a souped up version of the MLP:Online engine. The original post on the subject can be found here. Also, I'm having some trouble finding recordings of the various fangame panels (along with Stable Softworks' infamous "fnagame"), or details on A Foal's Errand. If any of you happen to have anything, post it in the comments and I'll throw it up on the site. 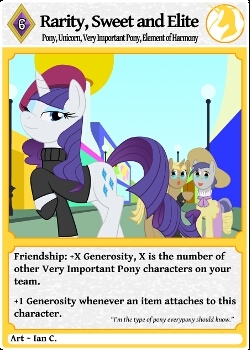 I've seen plenty of ponified Magic the Gathering cards before, but I've never played the game myself. Today, I headed to DeviantArt to put together a post - and was absolutely blindsided by the scale of the game. Below the break, I've rounded up a long list of galleries and tried to make sense of it all. I can't guarantee that every set's balanced, but I'm sure you can put together one heck of a game! Buckle up - this one's a doozy. After his latest game received negative reception from us a week ago, Bhaalspawn finally decided that it'd be a good time to fix up his game after letting it sit for several months, and has released a new patch for it that apparently addresses most of my complaints from the review. I haven't tested it out myself, but if you were disappointed with the previous version, now might be a good time to give it a second chance. Release notes below the break. Looks like the Super Smash Ponies development team thought now would be a good time to release some footage of Rarity, and boy were they right. It looks incredible so far, and while I doubt it'll reach Fighting is Magic-levels of greatness it should still make for one great fighting game. Then again, they're two entirely different types of fighting game, so I really shouldn't compare the two projects to each other... Also, I kind of feel sorry for Applejack in this trailer. Why does everypony always seem to pick on the poor gal? 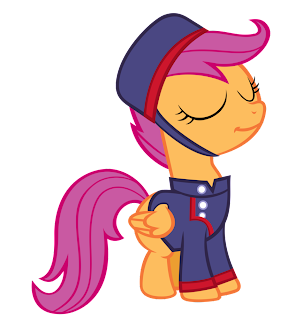 It's not like she's done any harm to anypony, unless you count that "baked bads" incident. No, this is not a serious review. 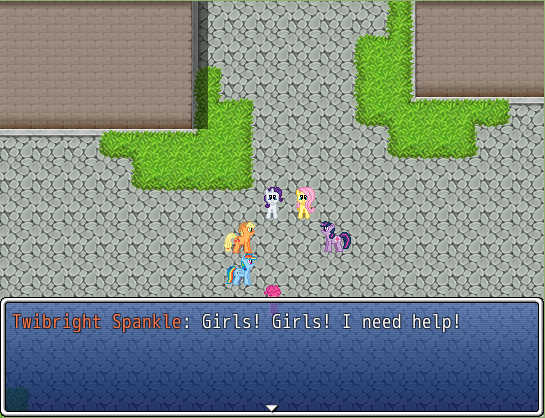 Hot on the heels of the last fnagame comes another game in this brave new genre (introduced by Stable Softworks in their BronyCon panel announcement), and again it stars Twibright Spankle and her magical pony friends. Lovingly crafted by a dedicated artist, Fnagame is a homage to RPG classics such as Lennyage of Harmoney and Gates of Tartarus, and promises to stun the world in a similar manner as the recently uncancelled Fighting is Magic did (more on that in a future post). Our review on this revolutionary new fnagame can be found after the break. 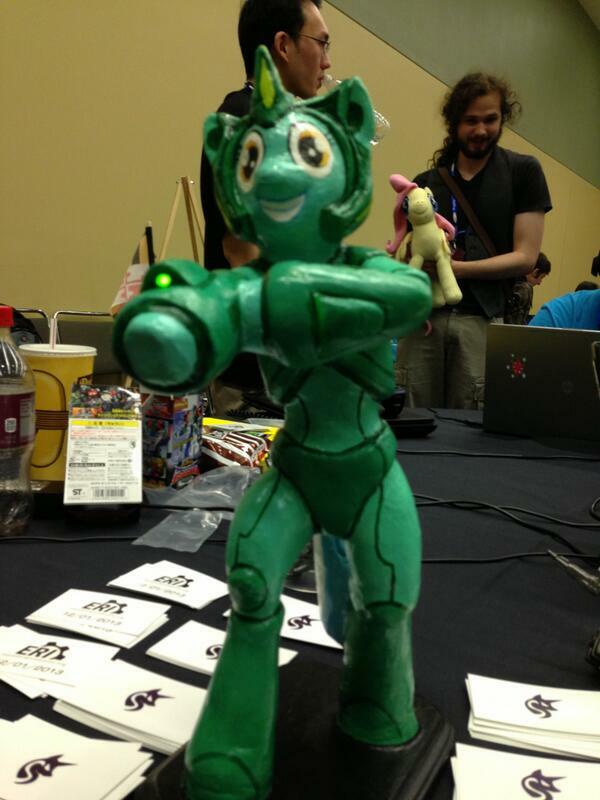 The Brony fnadom is pretty large, sure, but one thing it has always lacked was decent fnagames. But fear not, my friends! 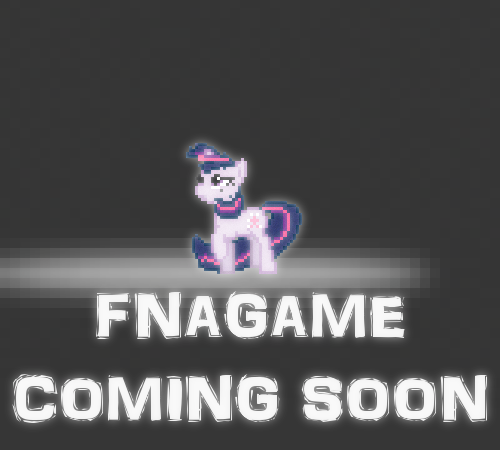 The world's first-ever fnagame (ingeniously titled "Fnagame") has been released to the public, starring Twibright Spankle and her friends Pokey Pi, Paddlejack, Pearity, Flutters and Colorful Speed as they do battle against a bunch of goons from the My Little Game Dev forums. Alicorn Cheerilee is there too. It even has a highscores list! BronyCon is off to a raring start, and thankfully there are quite a few fangame-related panels on today's schedule. First off, at 11:30 AM EDT in the Hall of Dusk there is the panel for Guild of Unicorns: A Game Project, which should be fairly interesting as it is for a fairly unknown fangame. I myself have never heard of before, but apparently the creator been interviewed on Derpy Hooves News a while back so his game is probably decent enough. Then at 4:30 PM one can see the Ponycraft: Tainted Skies panel (again in the Hall of Dusk), and at 6:00 PM one can play a build of the game in the Baltimare Arcade. Also at 6:00 PM one can find the Outside the Stable Softworks panel in the Hall of Dawn, where you can learn how to make your very own fnagame (whatever that is). Also, make sure to check out the Starlight Studios booth in the games room to check out their Project Cygnus demo. Ok, so I'm late on this one - I blame my long hiatus. However, for those of you who still haven't heard, the developers of the stalled project Questria have put together a really impressive presentation and game trailer over on Indiegogo. 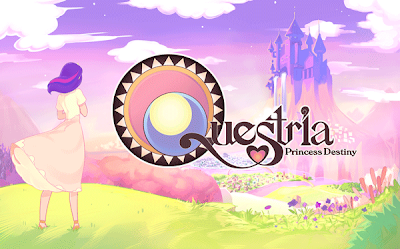 The project titled Questria has been in the works for a long time - originally, it was planned as a 3D pony game, until the developers officially detached the project from the My Little Pony name. 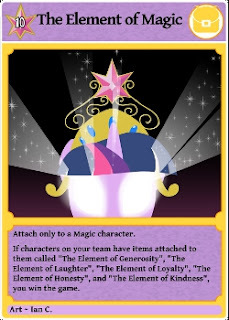 Now, it seems the game has re-emerged with all pony-related vocabulary and trademarks conspicuously absent - but the developers seem to be toeing the copyright line as close as possible. The new Questria trailer shows off some impressive art and 3D gameplay, and the project seems polished and well-organized. However, with character art that humanizes the mane six down to the horns, and names like Trix, Sirelestia and Twibright Spankle, it seems likely that this project is headed for a C&D notice down the road. Hopefully, the team knows what they've gotten themselves into. Check it out! 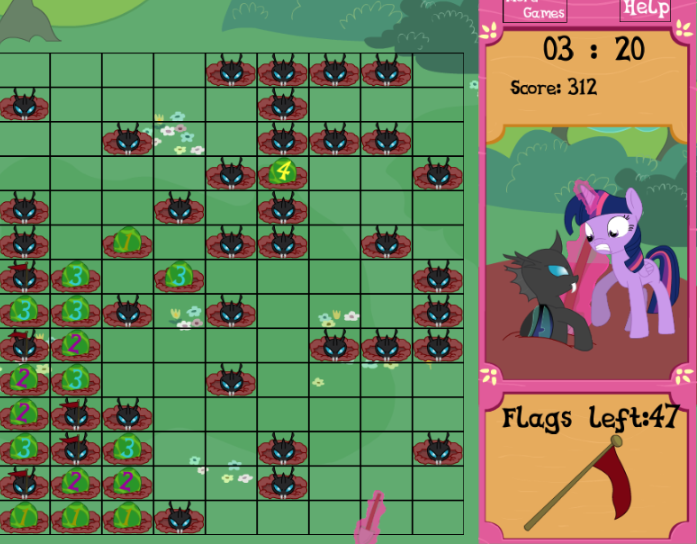 It's a cold, dark, stormy afternoon (at least, it is where I live) and that puts me in the mood for pony horror games! 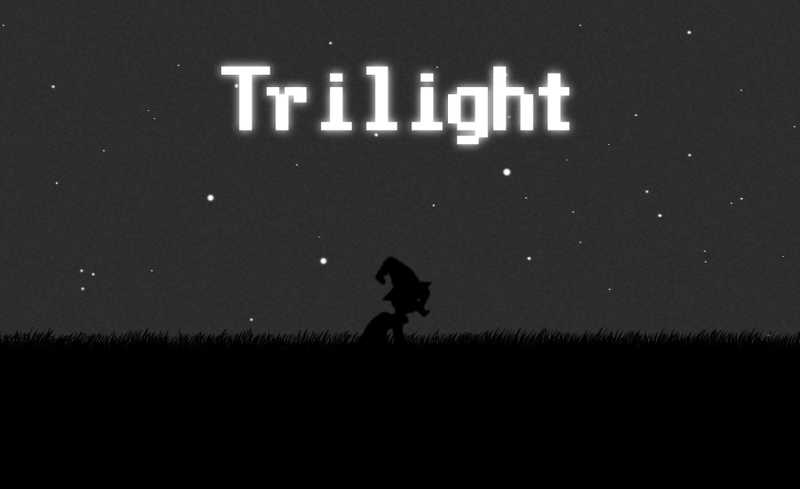 Trilight is probably better described as "puzzle-horror" - the game puts more emphasis on creatively interacting with the environment than creepiness - but it fills the void all the same. Flipping between Applejack, Rainbow Dash, and the Great and Powerful Trixie, the player must make their way through a darkened landscape full of traps and mysterious shadow ponies. Each of the three playable characters has their own powers - bucking, flying, and conjuring shadowy blocks - to help overcome obstacles along the way. The demo's only a few short levels long, and never gets very technical along the way, but it's enough to hint at the puzzles and thrills to come in the game's full version. My only complaints are a couple of hit box bugs that occur when you run or jump into an immovable object - sometimes, you'll end up sliding backwards or stuck when trying to jump upwards. Still, that shouldn't slow you down much. Have at it! Edit: The team's looking for a writer and artists - check the comments for more information.